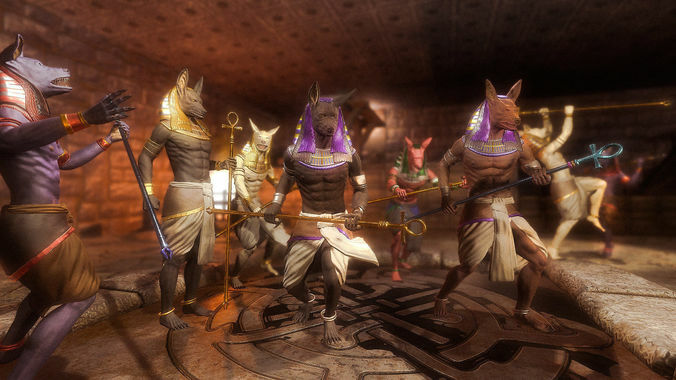 Anubis Pack PBR is a highly detailed PBR character featuring the ancient Egyptian god Anubis. Details have gone into this character that will probably be invisible in most game -- fine movements of the eyes, the snout, and even how the ankle bracelets react to animations. This is a great addition to the Egyptian theme, starting with the Mummy & Sarcophagus Pack PBR. He features a Humanoid rig (re-targetable to and from other humanoids!) with a staff as his main weapon. The staff is held with two hands, although he also uses it one-handed at times. It can be replaced with any other staff or spear for even more customization. DEMO VIDEO http://www.youtube.com/watch?v=Pt7iMg1EZys - This is the demo of our first Demo Scene. It showcases the animations as well as the included texture sets. CUSTOMIZE TEXTURES Use sliders to adjust the look & feel of the monsters. Easily change colors, add special effects like dirt, mud, blood, ice, snow, moss & more. It's fast and allows you to create any number of looks that perfectly suit your game. Most texture maps are 2048x2048. Use the Texture Creation scene to quickly modify the look of the models, and then use the Mass Export tool to export all the Procedural Materials into game-ready Standard Shader materials with a single click. MESH MORPHING Exposed Blend Shapes allow for massive mesh morphing and customization. You can save settings in prefabs or script the shapes for in-game customization or randomization of your characters. Now you can spawn completely random enemies that all look different from each other. CUSTOM RE-MIXABLE MUSIC (Coming Soon) Music has been composed specifically for the characters we produce. The tracks are separated into layers and set up for use with the Unity Audio Mixer. Use this to mix your own tracks, and create the perfect sound for your game levels, and export all your mixes with a single click into game-ready .wav files!A Composers Mix is also included if you do not want to mix your own track, and you can easily export the included mixes as well. SOUND EFFECTS (Coming Soon) Many of the animations now feature matching sound effects, along with a simple audio controller script that makes playing them and controlling things like volume, volume by speed etc easy. Nothing brings characters to life like high quality matching audio. CONCEPT ART Extra High Resolution images are provided in layered photoshop format for customization. Use these on your Steam page, your manual, your website & other advertising material to bring your game to life before you have gameplay to show. PARTICLES Custom particles (magic spells etc) are included whenever appropriate. The package also includes our entire Magic Spells & Particles Pack, so you can create your own magic spells. LEGACY SHADERS Don't be fooled by the requires Unity 5 message! The textures our system exports work with legacy shaders the same way any other character you already have does. You'll need Unity 5 to set up the textures, but once exported, you can bring them in to ANY Unity version and they'll work. POLYCOUNT We provide multiple LODs from High Poly (good for cinematics) to Low Poly (great for mobile). However, I suggest you use Simplygon or Mantis Online (google it, it's free) for creating your own LODs that fit your project/platform.